Convenience is our goal – we have several Greater Cleveland Locations and we have now expanded to Youngstown. We will fit into your schedule with our flexible hours, including Saturdays! Come in to your neighborhood Hudec Dental office and our friendly staff will make you feel right at home! A preferred provider for many insurance companies, Hudec Dental goes the extra mile to contact your insurance company directly to verify your coverage and provide you with accurate insurance estimates before you visit. We also offer several financing options, including interest-free! Book an appointment today or call 216-325-9755 for more information. Please take time to download and fill out any forms you may need on your FIRST or NEXT visit. This will help make your visit a pleasant one. When/how old should my children come in for their first exam? There is no exact age in which your child should come to see the dentist. It is usually best that all of your child’s teeth come in first before meeting the dentist. If your child has a pain, injury or an area of concern, then please call the office right away for an appointment, no matter the age. How often should I brush for and for how long? The American Dental Associations recommends that you brush your teeth at least twice a day. Proper brushing should take at least 2 minutes each time. 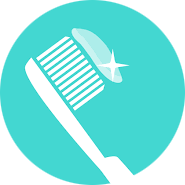 Brushing helps remove food and plaque. Plaque that is not removed can harden into tartar. Why is it so important to use floss? Flossing can help prevent cavities and gum disease. The American Dental Association recommends flossing at least once a day. By flossing each day, you help remove plaque from the areas where the toothbrush can’t reach. Plaque that is not removed by brushing and flossing can eventually harden into tartar. What happens if I am afraid of the dentist? Being afraid of the unknown is completely natural. Rest assured that our highly educated and trained staff will address all of your worries and provide you with a safe and comfortable environment. We will not proceed until you are completely comfortable, every step of the way. Yes! We are always accepting new patients at all of our locations. Children are welcome too. While decay often is cited as the primary cause of a toothache, it’s important for you to have a complete oral examination to determine the cause. 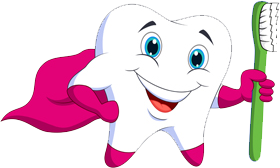 Other dental causes of a toothache include: infection, gum disease, grinding teeth, tooth trauma and an abnormal bite. Tooth eruption may be the cause of the tooth or jaw pain in babies and school-age children. A root canal is a procedure done to save the damaged or dead pulp in the root canal of the tooth by cleaning out the diseased pulp and reshaping the canal. The canal is filled with a rubberlike substance or another material to prevent recontamination of the tooth. 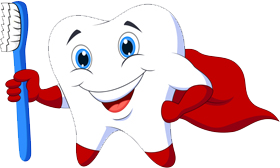 The tooth is then permanently sealed, with possibly a post and/or a crown made of porcelain or metal alloy. This enables patients to keep the original tooth. Brushing with toothpaste is important for several reasons. First and foremost, a toothpaste and a correct brushing action work to remove plaque, a sticky, harmful film of bacteria that grows on your teeth and causes cavities, gum disease and eventual tooth loss if not controlled. Second, toothpaste contains fluoride, which makes the entire tooth structure more resistant to decay. Third, special ingredients in toothpaste help to clean and polish the teeth and remove stains over time. Last, but not least, toothpaste helps freshen breath and leaves your mouth with a clean feeling. According to the Surgeon General’s report on oral health in America, a large percentage of the population suffers from a reduced quality of life due to oral and facial pain. This pain is largely due to infections of the gums that can lead to tooth loss. More than 75% of the population is affected by some type of gum disease. Reports show that infections in the mouth can affect major organs. For example, oral bacteria can travel through the bloodstream to the heart, where they can cause bacterial endocarditis, a condition in which the lining of the heart and heart valves become inflamed. Poor mouth care also can contribute to oral cancer. In addition, poor oral health affects the digestive process, which begins with physical and chemical activities in the mouth. Mouth tissues reflect symptoms of other problems throughout the body. In addition, many diseases can be diagnosed in their early stages through an oral examination. These diseases may be characterized by swollen or bleeding gums, mouth ulcers or dry mouth. Some of these diseases include diabetes, leukemia, cancer, heart disease and kidney disease. What happens during an initial dental visit? A thorough cleaning – checkups almost always include a complete cleaning. Using special instruments, a dental hygienist will scrape below the gumline, removing built-up plaque and tarter that can cause gum disease, cavities, bad breath and other problems. A full examination – our dentists will perform a thorough examination of your teeth, gums and mouth, looking for signs of disease or other problems. Their goal is to help maintain your good oral health and to prevent problems from becoming serious, by identifying and treating them as soon as possible. X-rays – depending on your age, risks of disease and symptoms, our dentists may recommend X-rays. X-rays can diagnose problems otherwise unnoticed, such as damage to jawbones, impacted teeth, abscesses, cysts or tumors and decay between the teeth. They may ask for a Panoramic X-ray as well. This type of film provides a complete view of your upper and lower jaw in a single picture and helps the dentist understand your bite and the relationship between the different teeth and your arch. How often should I see my dentist for a checkup and cleaning? Most children and adults should see their dentist for a regular cleaning and checkup every six months. People at a greater risk for oral diseases should have dental checkups more than twice a year. Tobacco and alcohol use, diabetes, pregnancy, peridontal and gum disease, poor oral hygiene and certain medical conditions are some of the many factors that our dentists take into consideration when deciding how often you need your dental cleaning and checkup.